If you watch this video and don't get to the part where Eugene Hutz is dancing on the desks, then you've missed the most rollicking and insane Tiny Desk Concert of all time. I've seen Gogol Bordello at a nightclub, and its live show is a gypsy punk circus, complete with a high-wire act. So when the band arrived at the modest NPR Music offices, I wanted to make sure we were covered technically; I figured they'd move around and wind up singing far away from our microphones. I asked Sergey Ryabtsev — Gogol Bordello's Russian-born violinist — if he thought bandleader Eugene Hutz might wind up dancing on my desk. With a huge smile and a large shot glass of vodka in hand, he said, "Don't worry about it!" By the third song, Hutz was sitting with the NPR crew in an office chair, singing his ode to alcohol. By the fourth, he was jumping from desktop to desktop, singing and dancing. Gogol Bordello is based in New York City, and has been performing its theatrical concoction of accordion, violin and guitar since the late '90s. The band writes songs about immigration and the celebration of cultural differences. 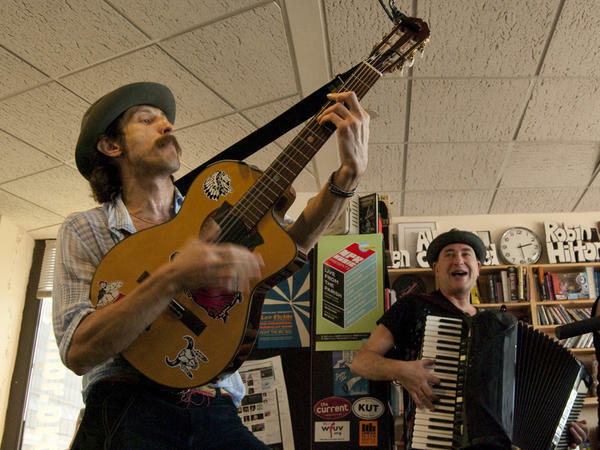 Now, for 2010, Gogol Bordello has its fifth album out — its first on a major label. Producer Rick Rubin, known for his Johnny Cash production and for co-founding Def Jam Records, helped make Trans-Continental Hustle. It's an album with more range than sheer thrust, and though the band played a few songs from that album at the desk, when Gogol Bordello is in front of a crowd, it's in full-throttle mode. No complaints there. To watch our most recent Tiny Desk Concert, featuring "Weird Al" Yankovic, click here.